Lords of Strife, from Revolutionary Interactive, is set in a world where Dark Lords have overrun the land, destroying villages and spreading their darkness. On peasant decides to rise up against them, but his quest is fraught with danger, especially given that 90% of the world is make up of spikes. The player is able to hop on scarecrows and enemies in order to clear spike pits (while also watching for spikes on the ceiling) and make it through each of the single-screen environments. 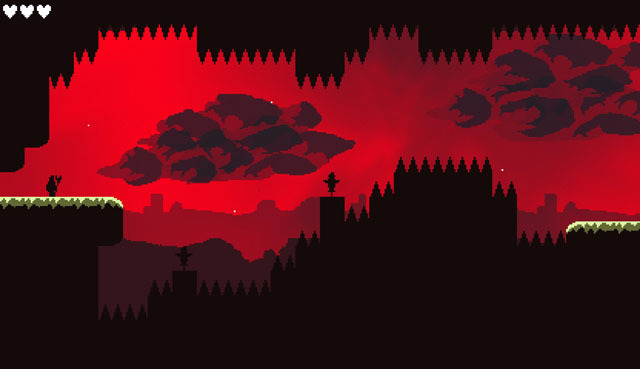 In many cases, the player must leap into the air and grab floating hearts just above spikes, which turn him invincible for a split second until he smashes in to the spikes below, bouncing him upward and into more danger. Each world terminates in a boss encounter against one of the Dark Lords in a high-flying fighting flurry against floating foes. The game will be out in just a couple of days. You can grab it on May 22 for PC, Mac, and Linux via Steam. Check our coverage here.